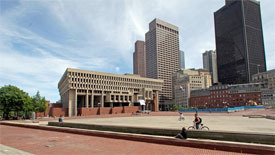 Mayor Walsh wants your creative ideas for City Hall. Let’s see what some of our creative thinkers will come up with. Walsh announced plans to “re-envision” the plaza to make it a more inviting and attractive civic space for residents and visitors during this year’s State of the City address in January…The master plan will identify areas for improvements at City Hall and the plaza, including possible public-private ventures, historic considerations and approaches for reuse, according to the solicitation issued by the city’s Public Facilities Department. It will look at existing conditions, including land use and zoning, and develop detailed cost estimates for the recommended work and programming.